In addition to the recent performance of Dido and Aeneas a few weeks ago, opera on campus has been continuing to grow. The Touring Outreach Opera is a new group on campus that was introduced by the Interim Opera and Musical Theater Director Joshua Borths. Borths previously held the Education and Outreach position at Arizona Opera, where he networked with local schools and youth programs to host professional singers from the company to perform short operas for the students. Chris Humbert, a senior vocal performance major and member of the group, explains that it is meant to be a learning tool for students. 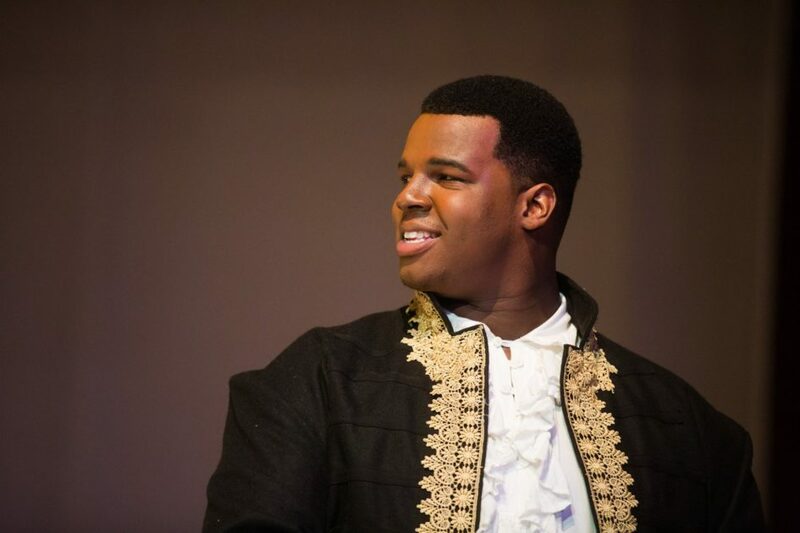 “The Touring Outreach Opera is an opera that is adapted for varying age groups for the purpose of spreading knowledge of music, while also portraying messages of anti-bullying, sharing, and other aspects of healthy community,” he said. Pictured is Chris Humbert, senior, in his lead role as Aeneas in Capital’s latest opera, Dido and Aeneas. To accommodate those who may not have the resources to come to campus, the group brings the shows to schools. They want to spread their message to as many kids as they can, because their messages are important for them to learn at a young age. This semester’s production will be Who’s Afraid of the Big Bad Wolf? The music is adapted from one of Mozart’s most popular operas, Don Giovanni, and the lyrics were written by Borths. In this adaptation, the big bad wolf goes around scaring and bullying Little Red Riding Hood and one of the three little pigs. Little Pig and Little Red team up to catch the wolf, make him apologize, and promise not to bully anymore. Using music to teach important lessons certainly is not a new approach, but it is an underemployed one. “Music activates both the left and right brain at the same time, and the activation of both hemispheres can maximize learning and improve memory,” Dr. Masha Godkin, a professor at Northcentral University, said. It is well known that the brain does not stop developing until around age 25, but people are most malleable during adolescence. By combining children’s stories with music, the Touring Outreach Opera is engaging students in a fun way when they are most open to learning. While they are the touring opera, they will also have events on campus.